Portrait of Balthasar Castiglione, ca. 1515. ↑ Jones and Penny, p. 171. 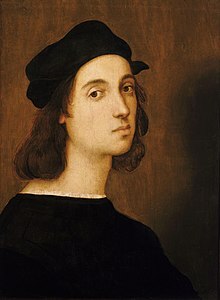 The portrait of Raphael is probably "a later adaptation of the one likeness which all agree on", that in The School of Athens, vouched for by Vasari. ↑ See, for example Honour, Hugh; John Fleming (1982). A World History of Art. প্ৰকাশক London: Macmillan Reference Books. পৃষ্ঠা. 357. ISBN 9780333235836. OCLC 8828368. ↑ Ashmolean Museum "Image". z.about.com. 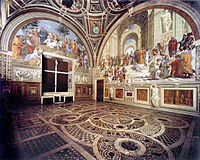 http://z.about.com/d/arthistory/1/0/W/O/raphael_colonna_01.jpg. ↑ The Royal Collection. "Gold ring with an onyx cameo of Ariadne". royalcollection.org.uk. 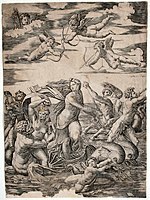 http://www.royalcollection.org.uk/eGallery/object.asp?searchText=&title=&rccode=&makerName=Raphael&category=&collector=&theme=&startYear=&endYear=&object=912759&row=2&detail=magnify। আহৰণ কৰা হৈছে: 26 August 2010.